KINGMAX wins the Golden Pin Design Awards 2016! 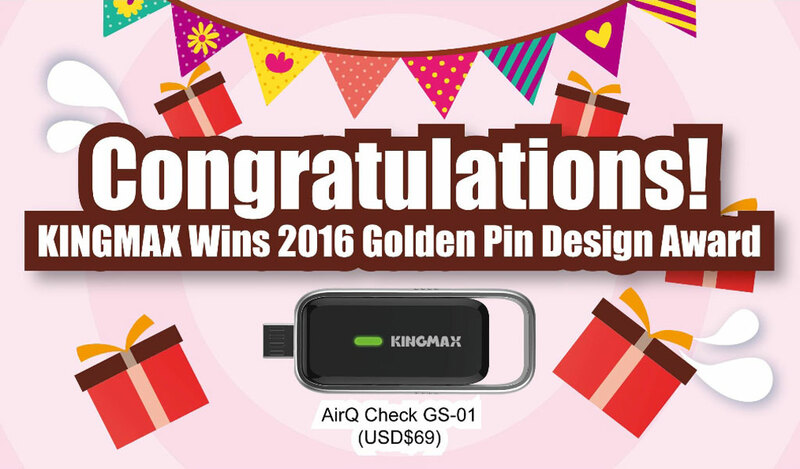 KINGMAX's AirQ Check Mobile Health Device has been selected as a winner for the Golden Pin Design Award 2016! A brief info about the Golden Pin Design Award, it is the top design awards body in the international Chinese-speaking market. The 35 year-old award in Taiwan invites top international design experts ever year to serve as the judges for the preliminary, secondary and final rounds judging. This year's entries came from 11 countries including Taiwan, China, Hong Kong, Macau, Japan, Korea, Singapore, Malaysia, Thailand, Canada, UK, Denmark, and Switzerland. Everyone from the KINGMAX team feels honored to see the AirQ Check stand out from the many exceptional submissions to achieve international acclaim and catch the judges' attention. AirQ Check is manufactured in Taiwan using the latest MEMS semiconductor technology. It features a stylish zinc alloy casing and ergonomic sliding cover. When not in use, it can be carried wherever you go. Plug it into the mobile phone to connect to the specially designed app to see if the levels of TVOC (a combination of different gases including Formaldehyde, Acetaldehyde, Alcohol, and Carbon Dioxide) and Carbon Dioxide exceed the recommended limits. It can also detect the temperature and humidity as well. The LED indicator light on the device also changes if harmful gases are detected. Green means good, orange means moderate and red means hazardous. The app will also beep if the concentration of gases is too high to help the consumer determine the current air quality.